This collection is a collaboration between SUGAR CANE and MISTER FREEDOM. 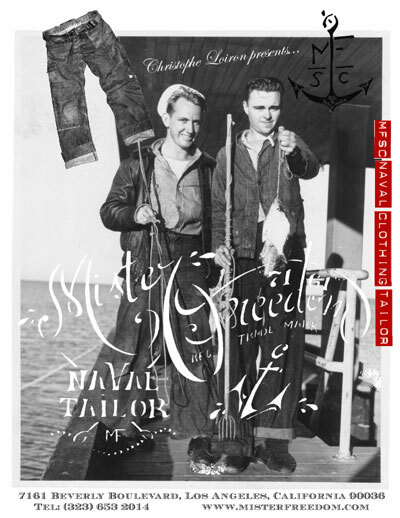 Christophe Loiron, Owner/Designer of MISTER FREEDOM in Los Angeles, created the original story of an American Merchant Navy sailor in the 1930s, who had his clothes custom-made by the local Naval Base Tailor, as he cruised around the world. Our sailor would bring his own designs (inspired by Army-Navy issued clothing, American and European workwear and personal taste…) and also fabrics (Sugar Cane fiber indigo denim, European cotton chambray, Stripe ticking, Khaki twill…collected during his travels) to the local “MFSC Naval Clothing Tailor”, to have his own work dungarees and uniform custom-made. 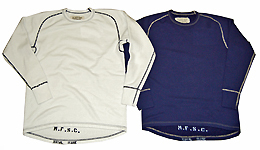 The Summer 2008 Collection was based on a cruise in the Northern Pacific that started in 1936. It showcased a denim Peacoat, utility chambray shirt, denim uniform shirt, khaki chinos, seafaring denim bag, and a pair of denim work dungarees. 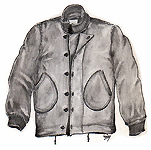 This Winter 2008 “The Last Cruise, Salty Years” Collection focuses on extreme weather gear, custom Naval Tailor-made. Our sailor had become an “old salt” (an experienced seaman) by then and his clothes were weathered and faded by sea water, sun and wear. 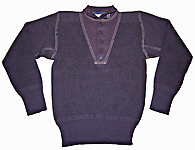 Although non-regulation, a popular practice since the 1920s for Navy enlisted men, was to have custom “LIBERTY CUFFS” and multicolored stitching added to their uniforms by local Tailors. Sewn on the inside of the garment and invisible to the patrol Officers, the fancy cuffs were rolled up and displayed while on shore leave. Our sailor CPO denim shirt and denim Peacoat are “LIBERTY ISSUE”, customized by the MFSC Naval Base Tailor, featuring a mermaid patch (also used as a secret money pocket) and hidden custom stitching. The Collection also includes a Modified Type of jungle cloth Deck Jacket and Deck trousers, a pair of Modified Type 7161 denim dungarees, a wool/cotton sweater, a rain hat and a cotton undershirt. Christophe Loiron’s concept of this MFSC Collection, although a fiction, is historically plausible and the resulting details of each garment, choice of fabrics, trims and styles, reflect this authenticity and accuracy.